The Microconic™ workholding system was developed to accurately hold and clamp small diameter parts in lathes and swiss style CNC machines. The system consists of two components: a Cartridge and a series of collets. In the past you where stuck with whatever was on the machine. Most systems designed to hold the largest part and not tailored to the small part and lose accuracy. We've changed all of that! We've created a workholding system that allows you to hold smaller parts with a higher level or accuracy and clamping pressure than every before achieved! We take care of the small end! The Microconic™ system consists of the cartridge and the collet. The Microconic™ cartridge fits in your machine just like a standard collet. The microconic collet then fits into the cartridge. The cartridge has an extended nose, which is solid from the front face to the rear of the cartridge. It is very rigid and accurate and much better than extended nose collets. The cartridge also provides fine control of collet clamping force, so that fragile or small parts can be held very carefully without damage, but with a solid grip and extreme concentricity. Currently our microconic™ collets are offered only in our 10mm size. Soon we will be releasing a 6mm size. Microconic™ collets fit into any of our cartridges. 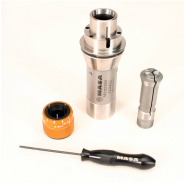 Precision Sub-spindle Machining is now an option where without MASA Microconic System, it was seldom or never possible! Fit into every host machine.